You may know dolmas (stuffed grape leaves) as the mysterious, tubular garnishes that you leave untouched when you order a Greek salad. This dish is similar in name only. Grilling the grape leaves (traditional dolmas use grape leaves straight out of the jar) makes them crisp and smoky rather than chewy and bland, while the salmon nuggets are kept moist because they're not exposed to direct heat. Just about the only thing you can do wrong here is buy inferior salmon; the recipe only works with the thick and fatty kind, so opt for king or coho over sockeye. These suckers are ideal for a small get-together. They can be assembled ahead of time and kept in the fridge; you can grill them in about four minutes total right before it's time to sit down. They're good anywhere from room temp to hot, they're easy to eat, and they're just unusual enough to impress your guests with your worldliness without scaring them off. 2. To form the dolmas, toss together salmon, large pinch dill, 1 teaspoon salt, black pepper and cayenne to taste, and canola oil in a mixing bowl. Rinse grape leaves under cold water and pat dry with paper towels. Place each chunk of salmon in the center of a grape leaf. Fold the edges of the grape leaf inward, and then roll up the grape leaf to completely wrap salmon. 3. Prepare grill by scrubbing grates with a grill brush and greasing with an oiled paper towel held in a pair of tongs. 4. Arrange dolmas crease-side down on hot side of grill. Sear crease side until crisp and lightly charred, about 1 minute. Flip and sear smooth side until crisp and lightly charred, about 1 minute. 5. Transfer dolmas to cool side of grill. Cover grill and cook until salmon is medium/medium-rare (a knife or skewer inserted into the center of a dolma for a few seconds will feel warm but not scorching hot to the touch), about 2 minutes. Transfer dolmas to a plate. Turn off grill (if using gas). Scrub grates with grill brush before coming back inside. 6. To make tzatziki, stir together yogurt, red onion, cucumber, parsley, small handful dill, lemon juice, and olive oil. Season lightly with salt, pepper, and cayenne. Taste and adjust seasoning. 7. 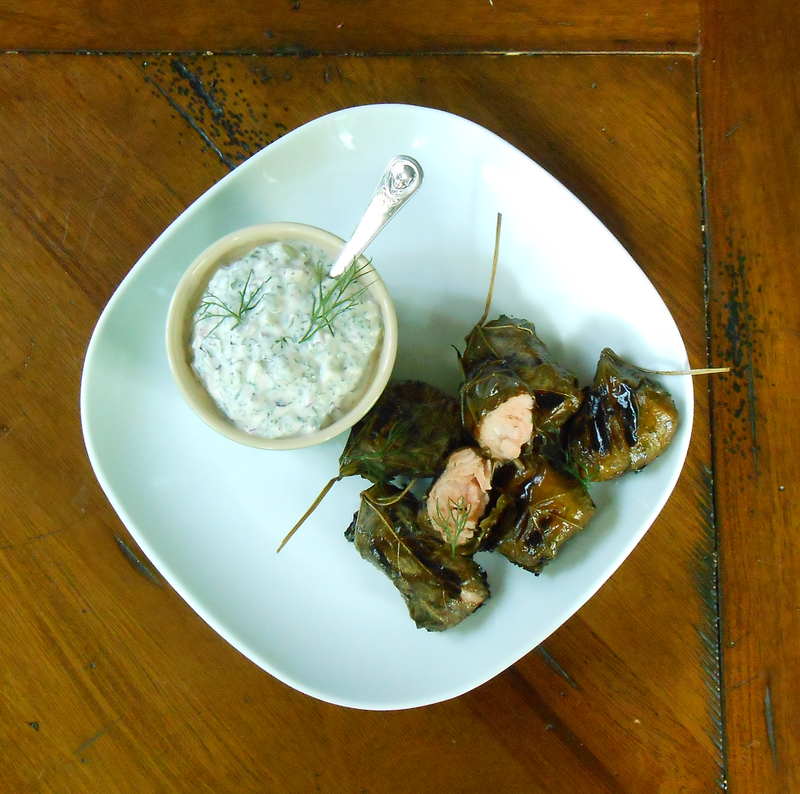 Serve dolmas hot or at room temperature with tzatziki on the side. Try to show some restraint and eat in two bites instead of one, especially if you have company.